The Adams family had double the reason to celebrate during LWC’s 2018 spring commencement ceremony. For Susan and Logan Adams of Somerset, Ky., Lindsey Wilson College was a family affair. 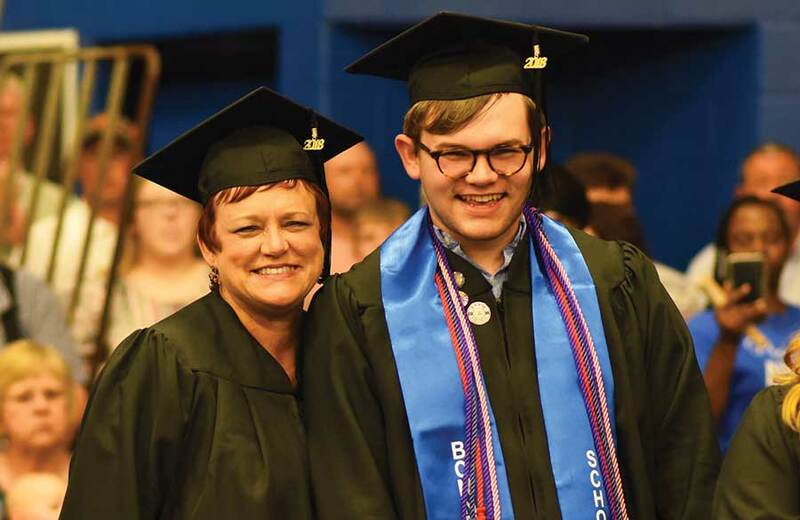 The mother and son graduated together from LWC at the college’s 107th commencement ceremony on May 12. Susan said it was special to share the day with her son. Susan said she was also nervous about drawing attention away from her son. Not only did Susan and Logan graduate together, but they also earned the same degree – a bachelor of arts in human services and counseling. They said that going through the journey together strengthened their relationship. Susan earned her degree through LWC’s community campus at Somerset Community College. Logan had a more traditional experience by enrolling on the A.P. White Campus and living in residence halls. For Logan, LWC was his second home. The Adams family has a deep connection to LWC. Vice President for Student Services and Enrollment Management Dean Adams ’78 is Susan’s brother-in-law and Logan’s uncle. Dean’s wife, Valerie J. Murrell ’90 Adams once served as the college’s alumni director. And their daughter, Devon Adams Jett is a 2002 LWC graduate. Logan’s cousin, Caleb, will graduate in December 2018. Dean Adams said it was a special time in his life when Logan and Susan graduated from LWC.